It’s February, love is in the air! 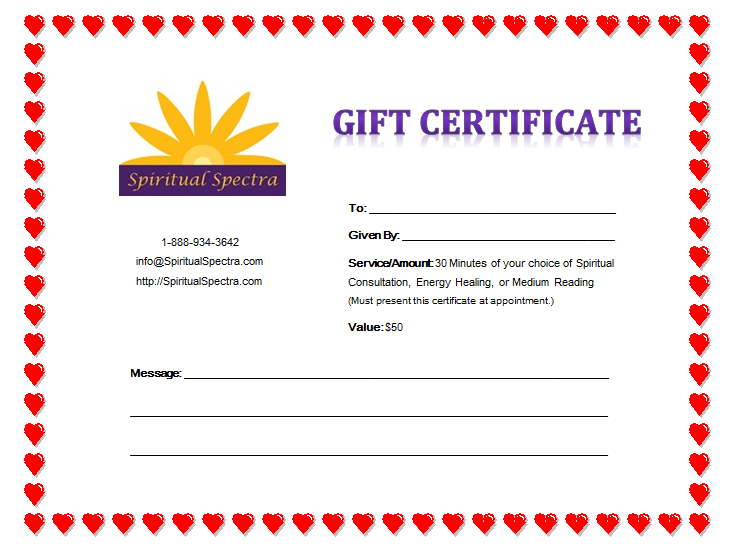 Valentine’s day is approaching and the perfect gift for the one who stole your heart or just the one who has a place in it, is a gift certificate to Spiritual Spectra. Support the one you love! The gift of a Spiritual Consultation can help your loved one receive guidance and the push they need to empower them to take the next steps in their life. This gift is one of a kind, and shows your special someone just how much you really care! Pamper the one you love! Allow them to luxuriate and relax as they feel the warm Energy Healing flow in their body releasing the stress of the work week and leaving them feeling serene and blissful. Have your loved one contact us to schedule their appointment. This entry was posted in Energy Healing, Health & Wellness, Holidays, Spiritual Consultation. Bookmark the permalink.